Are there any requirements in order to be a guardian? You need to pay your cost of the trip. The current cost is $1500 which covers air and land transportation, food, lodging, attraction entrance fees, flight bag, jacket, and t-shirts. Payment is not due until you are assigned to a trip. If you are a family member of a veteran you must be 16 years or older. If you are not a family member, you need to be 18 years or older. 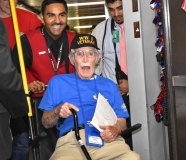 Your responsibility on the trip is to assist your veteran with whatever they need which may include pushing your veteran in a wheelchair up to 7 miles during a single day. You must be in good physical health, have good eyesight and hearing and be able to walk and lift 40lbs. You will be part of a team along with the other guardians who will help veterans get on and off the bus and help load equipment on and off the bus. You will be part of a “bucket brigade” so you will need to be agile, mobile, able to squat, and able to lift 40 lbs. 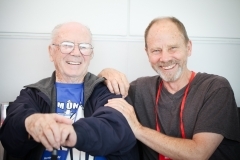 Can I be a guardian even if I am not related to or a friend of a veteran who is going on a trip? Yes, if a veteran doesn’t have a family member or friend to be their guardian we reach out to volunteer guardians who have submitted an application. You can also request an application to be mailed to you. 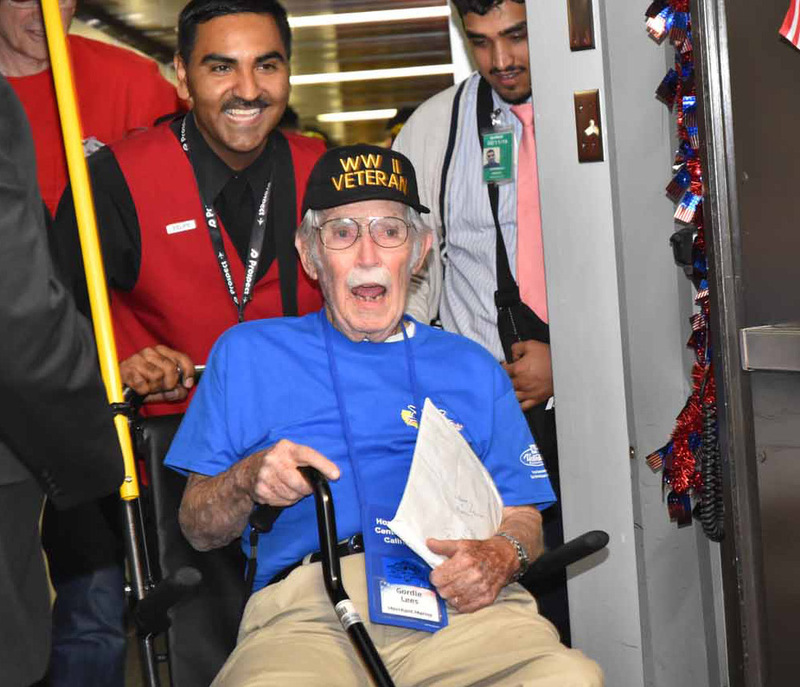 Contact us at PO Box 1750, Paso Robles CA 93447, Attn: Flight Information or call us at (805) 610-0180 or email info@honorflightccc.org. NOTE: by submitting an application you aren’t necessarily committing to going on a specific trip. 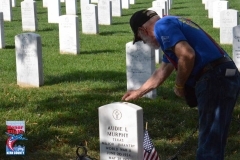 In most cases guardians are family members (children or grandchildren) of the veteran. Spouses and companions are not eligible to be guardians. If there is no family member or friend who is available to go as a guardian we reach out to our volunteer guardians. We normally need 1-4 volunteer guardians per trip. Volunteer guardians will be interviewed by an Honor Flight representative before they are chosen for a flight. We generally send out an email to everyone who has submitted a guardian application when we start to plan a trip (with the dates) and ask if they want to be considered. If you respond “Yes” then we will follow up with you if we need you for the trip. What if I am chosen as a volunteer guardian and can’t go on the trip? You will remain on the list and we will contact you when we start planning the next trip. Will I get confirmation after I apply? Yes. If you apply online you will get a confirmation page indicating that your application has been received. If you mail us the application you will be notified via email or a phone call that your application has been received. How long is my guardian application kept on file? Your application is kept on file until you tell us to remove it. 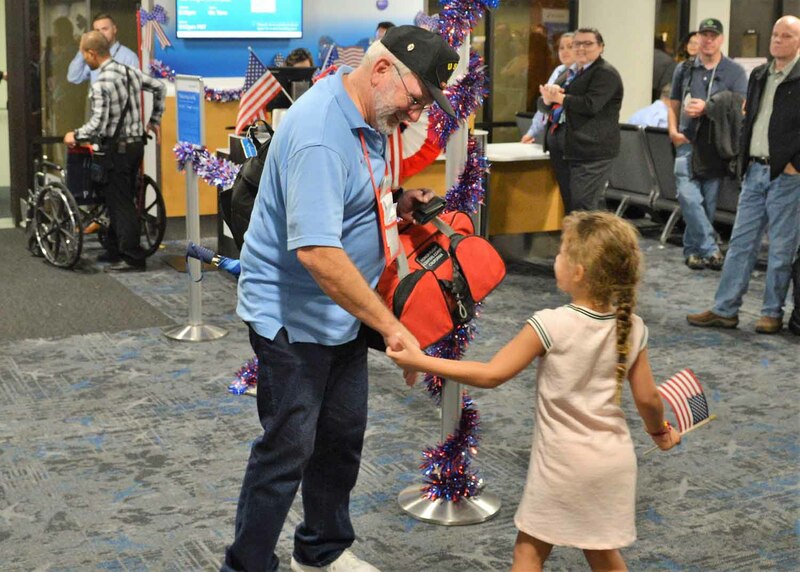 Any time you want to be removed from our list of possible guardians email us at flightinformation@honorflightccc.org or call (805) 610-0180. In addition, when we send out an email to all guardians on our list when we are starting to plan a flight, you can reply and tell us to remove your name. How will I be notified that you need me to go on a trip? We will contact you via the contact information on your application, usually a phone call. When will I get specific information about the trip? Once you are chosen to go on a trip you will receive a letter from us outlining the process. The letter includes the detailed flight itinerary, hotel, and other information. A couple of weeks before the trip there will be a luncheon for the veterans and their guardians held at the San Luis Obispo American Legion where additional details will be given. Yes. A couple of weeks before the trip there will be a luncheon for the veterans and their guardians held at the San Luis Obispo American Legion. At this luncheon there will be a mandatory training session for all guardians. How many Tours do you do a year? 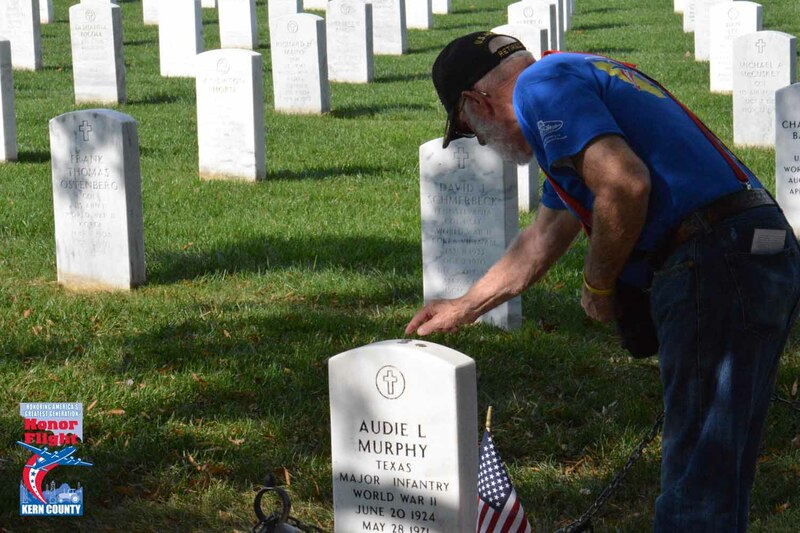 We currently, based on our fundraising efforts, do three Tour of Honor trips a year. Usually two in the spring and one in the fall. How soon after I am notified is my payment due? You can make two equal installments if you wish; the first is due two months before the trip and the second is due the month before the trip. If you pay by credit card we have to pass on to you the service fee (currently 4%) that we are charged by the credit card processing companies. What is the general schedule of the trip? In general it is a three day trip. You are responsible for getting to the San Luis Obispo airport, usually for an early morning flight. We arrive in Washington DC area in the late afternoon. The next two days are spent visiting war memorials and other sites of interest via bus. At the end of the third day we fly home, usually arriving in the evening. Will I have my own room or will I be sharing? If so, with whom? All rooms have double queen beds. You will most likely be staying with your veteran unless you are not a family member and of the opposite gender. What does the guardian fee cover, what other costs could there be? Your guardian fee pays all your transportation costs: air and land transportation, food, lodging, attraction entrance fees, flight bag, jacket, t-shirts, and airport parking. Any incidentals such as souvenirs you will have to pay for on the trip. Pack light. You won’t check any bags for the flight. You will be given a flight bag with two t-shirts and a jacket for the trip. You will be able to bring the flight bag and one additional carry-on bag if needed. You will be given written instructions concerning packing at the luncheon.